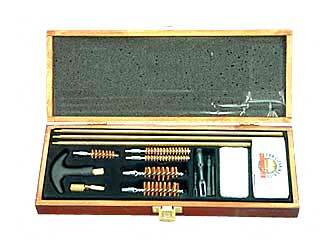 Deluxe 17 piece gun cleaning kit with wood case. Real wood storage box with flocked tray. Fits MOST shotguns, rifles and pistols. Contains: 3 solid brass rods, 1 universal handle able to accept rifle/pistol or shotgun rods, 1 universal handle adapter for rifle/pistol rodsw, 5 brass wire brushes to fit: 12 gauge, 20 gauge, 30 cal, 40 cal and 22 cal. The kit also contains 2 solid brass adapters for shotgun mop/brushes and rifle/pitsol bruhes and mops, 2 plastic slotted tips, 2 plastic punch tips, 1 polishing cloth and 50 pieces of 3" x 3" cloth swabs.